Once, in my blog on LiveJournal, I wrote about the best things in the world which France has—cognac, fashion, wine, cuisine… My opinions caused a real dispute. However, after ten days of staying in Provence, France, my confidence in the incredibility of Provençal cuisine seriously weakened. I should even say, it collapsed. Apparently, one cannot talk about French cuisine as a whole; it is possible to talk only about the cuisines of the separate provinces. For example, just about 150 km from Gordes (a small town in Provence), the food was really mouthwatering. What an onion soup we ate in Carcassonne, in the province of Languedoc! What a cider! What a salad! The first French restaurant and the first French dish. It was frog legs with garlic sauce. Not bad, but obviously it is far from World Heritage. We were surprised. Let’s proceed. The next was salad. Not bad, but obviously far from World Heritage. Average Moscow’s restaurant can offer even better dish, notably in two variants – battered and in sweet-and-sour sauce. We are surprised. Let’s move on. Salads go next. Salad with fried goat cheese. Provence, France. Fresh? Yes. Beautiful looking? Absolutely. Tasty? Well, I should say not. It was made without imagination. Coffee. A complete disappointment. The French don’t know what CAPPUCCINO is. They think that cappuccino is something like bad black coffee with whipped cream from a dispenser. Desserts! They were much more delicious in the Magic Life Kemer Resort in Turkey. But the French go a step further: they make dessert out of any dish. Every salad or meat dish contains at least one sweet ingredient. The apotheosis is a meat with jam! Provence is definitely not the reason the people from UNESCO decided to include French cuisine in the World Heritage. There is one dish that could be worthy of this honor, but it could not be called pure Provence. I have in mind a tartar. We tried it for the first time in Picardy, France, half a year ago. Tartar is a portion of red minced beef mixed with different sauces and herbs. We were nervous of eating it at the beginning (raw red meat, after all), but remembering carpaccio and sushi, we rushed to the attack. Mmmm, it was yummy! Carpaccio has lost a big part of its luster. Then, in splendid small town Gordes where we lived for several days in August, we found the Tartar Club, a restaurant specializing in tartars. It is located only a few steps from the central square of Gordes, and it offered more than ten variants of tartars. We chose the tasting set: three different variations of small tartars. From left to right: St. Tropez, Italian, and Traditional. The Italian was the most delicious. Later, we had one more tartar, traditional, at the foot of Marquis de Sade Castle. All the other items on the menu were the painfully familiar set of two – three dishes offered literally in every Provence restaurant. Only when our Provence journey was about to end, we finally came across a miracle in France—a good lunch—and in the very unexpected place: the ancient Abbaye De Montmajour not far from the city of Arles. Across the road from the Abbey, we found something like a self-made parking place. There were no towns and villages nearby; only a small cafe right by the parking area. We hid our Mini Cooper under the tree and went to the cafe. Nobody spoke English there, but our French was good enough to order something. We were not expecting anything extraordinary, but IT WAS BROUGHT. Where do you seek the Provençal cuisine, Michelin experts? As you can see, there are some places in Provence where one can get a delicious (and cheap) lunch, but you have to look for them for a long time, or know precisely where they are. I can safely recommend one such a place—the tiny cafe by the parking lot near Abbaye De Montmajour, Arles, Provence, France. P.S. Their chef who regularly appeared with the prepared dishes near the counter was suspiciously similar to an Italian, but I didnt clear it up being afraid that the French cuisine, which just now had barely climbed onto its pedestal, would fall again. I really enjoy this post. Wonderful scenery and food! I suppose you will change your opinion after reading this post. The food photographs are superb. I kept scrolling down to see the next one and then the next and then the next. Now, it’s time to read the text 🙂 It is also interesting. You are quite the food photographer, well done. I am so hungry for France now! You are warned about Provence and its cuisine. It looks good? Yes. Is it tasty? Not always. To get the real thing, you have to go into the small town, the very little places where the mass of traveling people do not go… Maybe is even difficolt to find such places, time has ruined a lot, I’m afraid! (Alike the swiss family I met in Japan: they orderet frenchfries with hamburger and swiss cheese in a sushi restaurant… and they got it! I was really ashamed of my own country). I am agree. 100% agree. Because of it, I don’t like capitals. We always seek small, non-tourist towns, and try to find the local cuisine. Oh wow… this post has definitely made me hungry. I love all the sweets and the wonderful robust soups you have listed. This is just an amazing post. What a delightful collection of delectable dishes. Je voudrais gouter les bon mets de Provence! Yes, nice look but average taste (only in Provence, I stress again). But not in the others parts of France. French cuisine is super, except Provence. Thank You, Lottie. Your opinion is particularly important for me. This post of yours is so astonishingly delicious! Well, at least, it looks so. Keep up the excellent photos. I’ll for sure keep coming back to see them. You make me hungry with those amazing pictures. Everything is tempting me except the tartar. Great shots! A tartar is the best dish in this post. Haha yes, Provence is one of those places that is slightly more hyped up. But really, like many countries, restaurants in France can also be hit or miss. You’re really better off going to smaller towns for real provincial food, and of course, every region has its different cuisines. Woohoo to the shout-out to Languedoc! Languedoc is super! I will write a big post about it soon. looks really delicious … Yummy .. Thank you, Nuggi. I’ll fix everything. My English is not perfect yet. It is interesting.Even if the food did not taste good – it looks good at least,hehe.A bit funny though,France is known for it cuisine all over the world. I tried, but the king is… well, you know. You can read my opinion, but note, I write about the cuisine of only one province of France, Provence. Other provinces were perfect. Chuckle. Love the final paragraph summing it all up. Great photos. 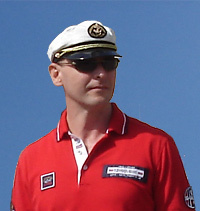 Thanks for the visit to my blog, and the likes too, Victor. I’m also a great Francophile, and Provencophile too, though the food can sometimes disappoint. the atmosphere never does, however, and it’s wonderful to find great food in surprisingly unpromising places. Yes, Richard, I am ready to go to France in any moment. I like this country. Your pics are making me hungry 🙂 Too bad that so many dishes didn’t live up to your expectations. I hate when that happens! Food is such a big part of travelling and it’s easy to be disappointed when it’s not that good… I don’t think I have spent any time in Provence yet. Next time, you might want to give Bretagne or Normandie a try 🙂 we had a blast (and many a delicious meals) there. Bingo! We have been there and had the same experience. You just made me seriously hungry, and since it’s supper time, I’ll say good-bye for the day. Thanks for letting me camp out in your blog this evening. I had a great time and tried to leave my campsite as clean as when I arrived. The only photo with desserts in this post shows a warm apple cake with cinnamon and almond cake which we ate near the Amiens cathedral. You can check in Google where this cathedral is located. There was no IKEA nearby. ohh it makes me feel hungry!!! You was more fortunate. I am very glad for you. 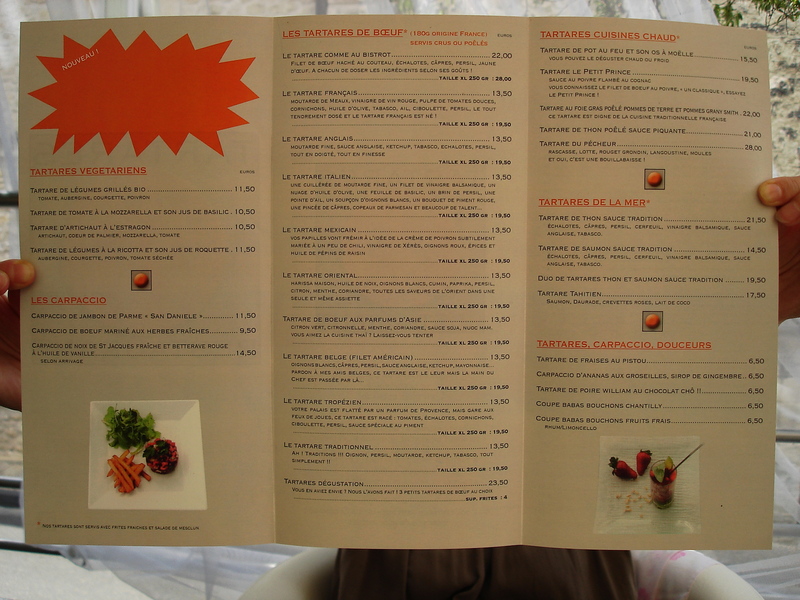 We ate in Avignon, Gordes, Sault etc., but had only very average dishes in Provence. Apparently a large number of tourists spoiled this region. In four weeks, Bretagne is waiting for us with its cheese and oysters. We’ll see. Those food photos make me hungry. And you say these are not so good? I think they look good but maybe there is something better…. I agree about the onion soup. It needs WAY more cheese. But the rest looks great. It seems to me, any food is looking good, but not any is tasty. You surprised me with this post. Here in Montreal we have some great French restaurants and have had some great meals eating Provencal cuisine. So it’s a surprise that the motherland has slipped…as another commenter said, it’s the tourists – the usual excuse for serving sub-par food (that no local would accept). Exactly, Frank. It was a real shock for us. I am sure Provence has SOME good restaurants; however, usually, we don’t seek SOME good restaurants in Italy, we just take our seats where we want and always get a great meal. This is a big problem in Provence. I really enjoy reading your posts of your travels! It just goes to show that one can get good food and bad food just about anywhere in the world. We live and learn! Also, are you fluent in speaking French? No, my French is very bad, three or four words; however, thank God, more and more of the French speak English.